January 9 - Following its purchase of the Bangor and Aroostook Railroad and its subsidiaries, operations begin on the Montreal, Maine and Atlantic Railway in New England, Quebec and New Brunswick. 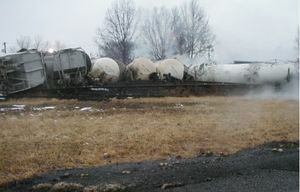 Derailed cars from a CN derailment, February 9. February 9 - A northbound Canadian National Railway train derails (pictured) due to a cracked rail joint near Tamaroa, Illinois, releasing hazardous materials, some of which ignite; about 850 people are evacuated from a 3-mile radius of the accident site. February 16 - Following a massive snowfall in the Baltimore, Maryland, area, half of the roof on the Baltimore & Ohio Railroad Museum's main building, the historic roundhouse building, collapses under the weight of the snow. March 6 - New York Metropolitan Transportation Authority Chairman Peter S. Kalikow announces an increase in the basic fare for the New York City Subway from $1.50 to $2.00, the highest basic fare in the nation at the time. Derailed cars from a UP runaway, June 20. 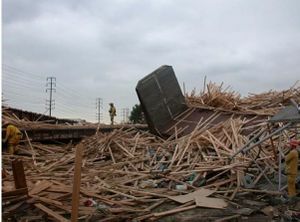 June 20 - An improperly secured string of 31 freight cars carrying lumber products runs away from Union Pacific Railroad switch crews in Montclair, California, and derail about 28 miles away in City of Commerce, California; some of the cars collide with nearby homes, destroying three houses and injuring 13 people. 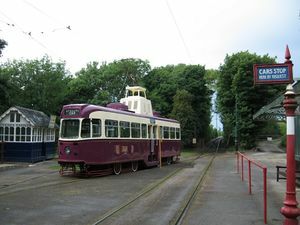 Leeds 602 makes a surprise appearance at the National Tramway Museum's Tramathon. The East Hayling Light Railway, a brand new light railway in Hayling Island in Hampshire in the UK, opens. October 12 - Westbound Metra train 519 departing Chicago traverses a crossover rated at 10 mph while traveling at 68 mph and derails; 47 of the train's 375 passengers are injured in the accident. November 15 - A northbound Union Pacific Railroad freight train runs past a signal displaying a stop indication and collides with the middle of a southbound BNSF Railway train traversing a crossover near Kelso, Washington; the crew of the UP train are injured, and a subsequent NTSB investigation shows that the engineer of the UP train had fallen asleep and did not see the stop signal. December 19 - The H-Bahn system at Dortmund University is extended 1.2 km to the neighboring technology park. The interchange facilities between Hong Kong MTR's Tsuen Wan Line and KCR West Rail at Mei Foo open. The Derwent Valley Railway reopens the line to National Park. ↑ Significant dates in Canadian railway history. Colin Churcher's Railway Pages (2006-11-28). Retrieved on 2007-01-04. ↑ Railroad Accident Report: Derailment of Canadian National Freight Train M33371 and Subsequent Release of Hazardous Materials in Tamaroa, Illinois, February 9, 2003. United States National Transportation Safety Board. Retrieved on 2008-01-08. ↑ About the Museum: History of the Museum. Baltimore & Ohio Railroad Museum (2005). Retrieved on 2008-02-13. ↑ The coming of the subway to New York: a history of the New York City subway as reported in the pages of Railway Age and Railroad Gazette. BNET (June 2003). Retrieved on 2008-02-29. ↑ Railroad Accident Brief: Derailment of Runaway Railcars on Union Pacific Railroad, City of Commerce, California, June 20, 2003. United States National Transportation Safety Board (2004-04-07). Retrieved on 2008-01-18. ↑ Railroad Accident Report: Derailment of Northeast Illinois Regional Commuter Railroad Train 519 in Chicago, Illinois, October 12, 2003. United States National Transportation Safety Board. Retrieved on 2008-01-07. ↑ Railroad Accident Brief: Side Collision of Burlington Northern Santa Fe Railway Train and Union Pacific Railroad Train near Kelso, Washington, November 15, 2003. United States National Transportation Safety Board (2005-06-06). Retrieved on 2008-01-07. This page was last edited on 30 January 2012, at 19:43.